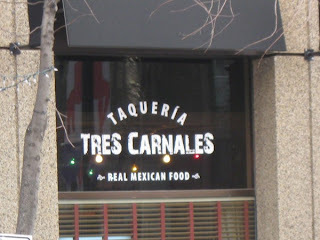 Since opening its doors on Rice Howard Way last summer, Tres Carnales has taken the city of Edmonton by storm. Lineups are frequently out the door, and tables can be hard to find at peak hours. Filming recently took place at the restaurant for a piece on The Food Network Canada's show "You Gotta Eat Here! "...so I figured I'd better! The arroz nearly didn't make it back to my office (after I dropped its bag in the snow on the walk back) but I'm glad it did! The rice was perfectly cooked, retaining slight firmness, in a mildly spicy seasoning. 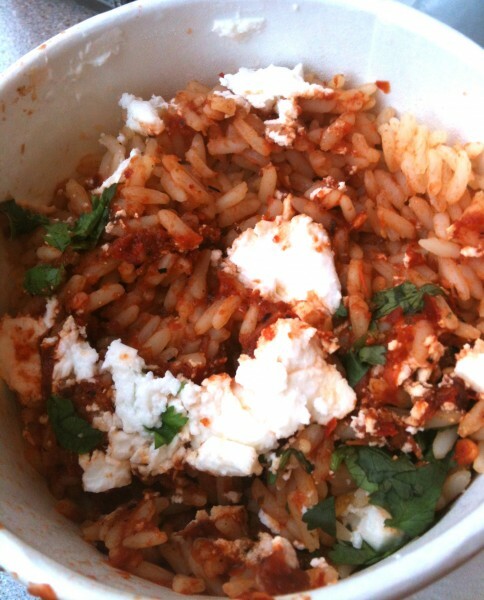 The salsa roja added a delicious brightness to it and contrasted beautifully with the salty queso fresco. Ten dollars will get you three or four (depending on the filling) small double wrapped tacos with your choice of filling, topped with cilantro and raw white onion. I could see this dish being a bit unsatisfying for those who really value humongous portion sizes, but if you appreciate quality over quantity I think you'll be very happy will your selection. The pollo (chicken) asado was excellent: tender & moist. The accompanying sauce lent a bit of heat, but mostly bright flavor -- don't ignore it! The magnum opus. When I initially laid eyes on my torta al pastor (Mexican sandwich with pork) my first thought was, how the heck am I going to get that into my mouth? My next thought, after some masterful maneuvering to get my first bite: Where have you been all my life?! A splash of lime juice brightened it up even more, and both my friend and I noted the familiar flavor of our favorite comfort foods (namely meatballs & meatloaf) in the sandwich. A note of caution: this beast is messy. I managed to get it all over the table, the floor, my pants, and, of course, my deliriously happy face. It's hard to tease out and put into words what exactly made it so incredible, but the combination of the delicious marinated pork, creamy avocado spread, perfectly toasted bread, sauce, tomatoes & onions resulted in the foodie-equivalent of a religious experience. 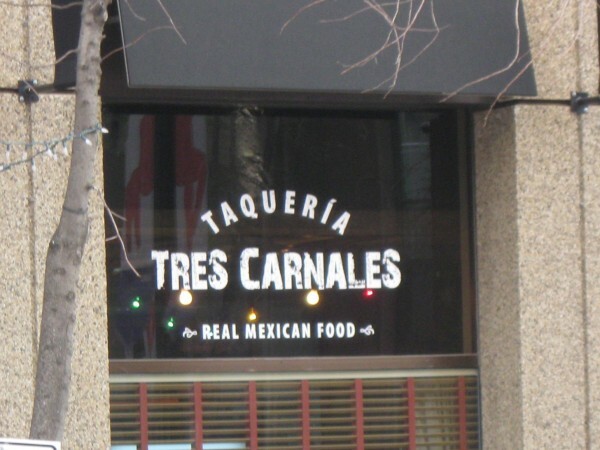 Tres Carnales' passion for food is obvious, and some serious love and attention clearly goes into their food. 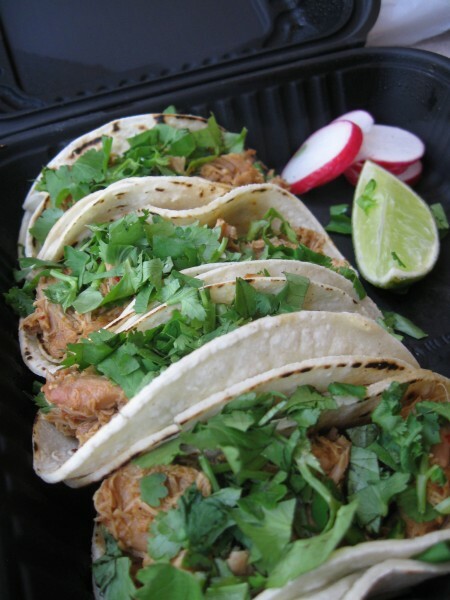 From the fresh simplicity of the tacos, to the hearty amalgam of the tortas, the food is made from scratch, it's fresh, it's full of flavor, and, ultimately, it's delicious. The torta al pastor I had at Tres Carnales is among the best things I have eaten. Ever. The Food Network didn't get it wrong. Indeed, "You Gotta Eat Here!" Chicken for Lunch is a take-away place in the basement food court of Scotia Place. It's got very limited hours (11am-2pm, Mon-Fri) and a cult following. It doesn't hurt that the owners and their other restaurant, Lingnan, are featured on the show Family Restaurant on the Food Network. According to the regulars I met in line, however, the show doesn't matter -- it's all about the chicken! Indeed, the restaurant offers your choice of several homemade, mostly deep-fried chicken dishes over standard sides of noodles, rice and mixed vegetables and served with a spring roll. Everyone--no exaggeration--ahead of me in line was getting the hot & dry chicken as one of their options, so I had to see what the fuss was about. There was only a hint of heat to it (spice wimps, you'll be OK) and the dish was clearly freshly made with a nice batter and moist chicken inside. It reminded me of popcorn chicken, and, to tell you the truth, I missed sauce. The ginger chicken had lost its crispness under the sauce and was clearly not as fresh as the hot & dry (probably owing to the hot & dries increased popularity). The sauce was semi-sweet, but not overly gingery. The honey garlic chicken was my favorite. It was still crispy under the sweet sticky sauce, though I would've liked a little more garlic flavor. The Mongolian was also really good. When I ordered it, the owner stopped, looked me straight in the eye and said, "Are you sure? It's spicy," while motioning to it on the menu with its two chilis (the other selections I ordered were one chili on their heat scale). I went for it, wanting to try one of the alternatives to the deep-fried chicken dishes. The Mongolian chicken was stir-fried with veggies in a Mongolian sauce which was of medium heat, but very tolerable for me (NB: I'm a spice wimp who has admitted defeat to Moxies wings and been brought to tears by the chana masala at New Asian Village). The Mongolian gave me a sniffle. The rice, noodles and vegetables were pretty boring and bland, but the spring roll was a delight; it was full of chicken with a twang of onion. Chicken for Lunch isn't bad at all, but I think it's hyped up for what it is: food court Chinese food. However, with its homemade quality & reasonably freshly prepared chicken dishes it's absolutely a step above your standard Sizzling/Manchu/etc. Wok food court establishments. We made reservations for Lux on what turned out to be an incredibly cold January evening. Not wanting to tempt fate (or my car's battery) I opted to take the LRT as Lux is right across the street from an entrance to Central station. When I finally stopped shivering, after settling into my seat, I was able to take in the restaurant and was impressed. High ceilings and wood trim made for a chic-but-not-uppity atmosphere. The lounge, in contrast, is more dark, romantic, and has a neat water feature. I'd really like to go back on a weekend and enjoy a drink in there with some friends. I started off with a market salad which was pretty massive for the starter size I ordered. The mandarin oranges, cranberries, and candied walnuts went well with the mixed greens, and the white balsamic dressing was sweet with an acidic bite. The bison gyoza were homemade and delicious, especially with the honey basil sauce drizzled over top. The mandarin orange - cucumber "salsa" was not salsa -- more like a few sliced cucumbers with a load of canned mandarins. While unnecessary and bordering on excessive, it did look nice in plating. "Where's the beef?" The mushroom wellington is a vegetarian option on the menu. The flaky pasty and savory portabello au jus was enjoyed by my friend, and he had no complaints about the accompanying garlic mashed potatoes as he cleaned his plate. Two of my other friends went for the half chicken entree. Served with potatoes and bacon roasted corn, my friends did say it was good, but that there was nothing particularly special about about the chicken. This is a terrible picture of the kobe meatloaf, I know; it really did look better in person. Between the melt-in-your-mouth Kobe beef and the tomato peach chipotle chutney this was reportedly very, very tasty. The onion rings here are huge and coated in a thick, crispy layer of Stella Artois batter. They came with ranch for dipping, but it was totally unnecessary. These rings are heavenly all on their own. Only a few of us saved room for dessert. The chocolate cake was rich, moist, and very chocolaty. My friend really enjoyed the strawberry sauce is was served with. I sampled it and found it a bit too chocolaty for my taste, but the devoted chocolate-lovers I was dining with vehemently disagreed. I went with the carrot cake and, wow, I was sure glad I did. It was a slice of warm & spicy heaven. I've seen raisins and pineapple in carrot cake before, but this cake also included dates -- I was sold. I'm going to have to try that in my own carrot cake now! As good as the cake was, the highlight of the dish was the chai ice cream served along with it. It was full of warm flavors itself and went really nicely with the cake and cream cheese icing. 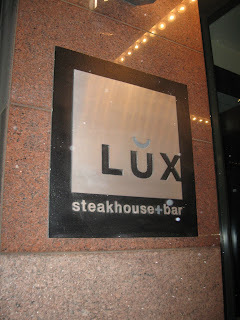 It feels a bit wrong to review a steakhouse when no one in my party had the steak, but its actually nice to explore all the other options available at Lux. It's got a great atmosphere, helpful staff, and beautiful & delicious food. I'm definitely looking forward to heading back there for a drink in the lounge and a ribeye! I drive by Pizzeria Prego's bright neon sign on a daily basis, and have occasionally peered in their window on my way to visit Sunterra, but finally ventured in to grab some dinner. They've got a pretty big menu with pizza (of course), pasta (lasagna & spaghetti), wraps, and basic salads and they seem to particularly emphasize their gluten-free offerings. The Caesar salad was slightly better than the standard I've had at a lot of takeout pizza places. I appreciated that they packed the dressing separate from the rest of the salad (to avoid sogginess) but there wasn't enough dressing for the amount of salad. I like the shredded parmesan, and the dressing was pleasantly lemony. Nothing special, but a good side for pizza. One of the sins many take-out pizza places commit is using their pizza sauce as the sauce on their pastas. Pizza sauce is not pasta sauce! Pizzeria Prego's lasagna came covered in cheese, as it should, with a meaty pasta sauce -- different from what was on the pizzas! It was basic, not mind-blowing, but not terrible. I appreciated the effort. You can get an 8" two topping pizza for $5, cooked to order, so we decided to get one of those, and one with a few more toppings. The pepperoni pizza with extra cheese on their standard crust wasn't as cheesy as I'd hope, nor was it particular meaty. It was pretty much your standard issue pepperoni pizza. I got a bit more creative with our 12" pizza: chicken, feta, tomatoes, spinach, and mozza on a whole wheat crust. Pizzeria Prego offers several crust options, including standard, sesame flax, whole wheat, and sunflower pumpkin. The whole wheat was just the right balance of chewy and soft texture with a slightly buttery flavor. The rest of the toppings complemented the crust nicely, but the crust was a total star. In a lot of ways, Pizzeria Prego is your standard neighborhood pizzeria with plenty of average dishes on their menu. It's clear, however, that some ingenuity has gone into their menu resulting in some gems. For persons with celiac disease or gluten intolerance it's a goldmine. Experiment with their plethora of toppings and crusts and you might even find a new favorite pizza. A few of my friends and I have been meaning to check out Sofra for some time now. We'd been disappointed when they were closed for their seasonal holidays but were determined to make it happen this week! In the chaos of everything, just as we were about to head over, we discovered no one in our group had made a reservation. Diffusion of responsibility. We decided to chance it and rushed over before to try to make it there before the 630pm rush and managed to snag the last free table! Everyone raves about the pita bread here, and with good reason. The moment you step in you catch the aroma of fresh [pita] bread and from our table we could see the staff rolling out and working the dough. It was thinner than the pita I've had at Greek restaurants (or from Superstore), warm, fresh, and topped with toasted sesame seed -- divine! The pita bread would have been excellent enjoyed on its own, but we had to try some of the dips. The hummus was great (though not quite as extraordinary as Parkallen restaurant's). The haydari tasted a lot like tzatziki though thinner in consistency. A small amount is served with the main dishes, and we all agreed it complemented the meat more than the pita. The sofra ezme is feta cheese based and was out of this world. It was salty, savory, and hearty and definitely the favorite of the three. Turkey meatballs - not the same as the turkish meatballs! The turkey meatballs we the special of the day (NB: turkish beef meatballs are a popular regular menu item). Ground turkey is seasoned, formed into balls, them flattened out and cooked on the grill. The resulting flavor was similar to falafel I've had, but with a more meaty texture and taste, of course. The chicken skewers were garlicky and tasty, a "safe" dish and pretty similar to Greek chicken souvlaki. If I had a do-over, I'd probably go for the turkey meatballs or try the beef meatballs or lamb skewers. The main platters are served with grilled vegetables, bulgar pilaf, salad, and the same haydari sauce we had with the pitas. The bulgar pilaf was flavorful and full of spices without having much heat. 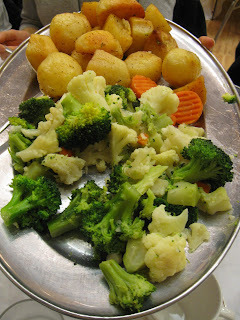 The veggies were perfect, and I would have preferred more of them over the salad. The dressing of the salad was much too sweet to be on the same plate as rest of the garlicky, savory meal. We finished our meal off with baklava, which was clearly moving so fast it was hard to capture on film. Baklava is very hard to get right but this was the perfect balance between sticky, flaky, and sweet. It was definitely among the best Baklava I've had. Sofra isn't cheap, but for your money you'll get good-size portions of freshly made, consistently tasty food. The atmosphere was great for dining with friends, and the service was friendly and prompt. I thoroughly enjoyed my meal here and am already plotting opportunities to return. However, I will warn you: if you don't want your breath to reek of garlic the rest of the night, bring a pack of gum for the meal's end. Unless you don't like your friends. Then exhale away. The 3 Amigos started off as a takeout joint by three brothers (hopefully they're still amigos) from the state of Oaxaco in Mexica. Though they eventually expanded to a full-service restaurant, they still do plenty of take-out, and, after a crazy day at work, it was a take-out kind of night. The take out side retains the bones of the old Subway restaurant it replaced, but it's clear that plenty of effort has been put in to make the space their own. Often on weekends a guitarist is present to serenade patrons with Mexican melodies. The nachos served here are made fresh on-site, not dumped out of a bag. Frankly, I'd enjoy them just as much with nothing on them. The mild salsa provided that we later dumped on top was indeed mild, but tasty nevertheless. We decided to sample both the chicken and the pork tamales. We enjoyed the spicy meaty filling, but, unfortunately, both were pretty dry. 3 Amigos offers seven varieties of tortas (a Mexican sandwich) to choose from, and I eventually settled on the chicken torta. It was loaded with lettuce, tomato, mayo, onions, refried beans, and avocado. The bread was nicely toasted, fresh & crusty, really complementing the contents. 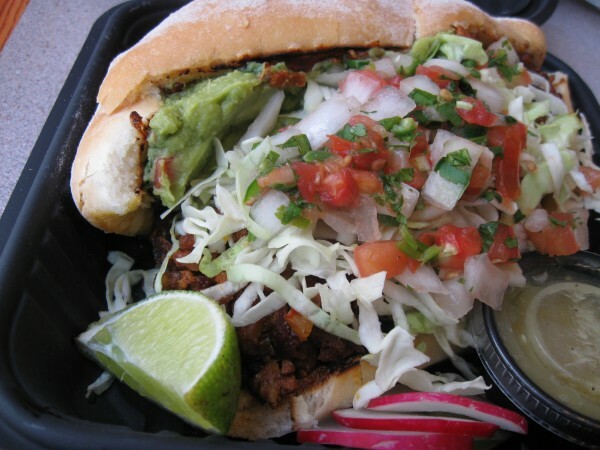 Tortas come with salad or fries. The salad was fresh but a bit naked without any dressing (not sure if that is how it is or if it was an oversight). I think I'll go for the fries next time. I've had their enchiladas before, and I really want to like them, but they never have left me wowed. The enchilada sauce is ok. The black beans they come with are ok. I actually really like the potato and rice blend they're served with. I wish I could put my finger on what's missing. The highlight of it all the was the pineapple empanada. The outside was perfectly crisp, and the inside was soft and sweet but could have used more pineapple. It came with ice cream, which was package separately so it wouldn't melt during the drive home. Unfortunately, even the most careful packaging couldn't save it from me forgetting about it on the counter. Reviews of Mexican restaurants always seem to attempt to judge a restaurants authenticity. I don't think I'm qualified to rate that, but I do know we had a pretty good meal, with a particularly strong start & finish. It's a nice addition to the neighborhood, and definitely worth trying, but I'm not sure I'd trouble myself to get there for a repeat visit if it wasn't so handy. Just West of the stadium is the Italian pocket of Edmonton, and the Santa Maria Goretti Centre is the heart of that community. 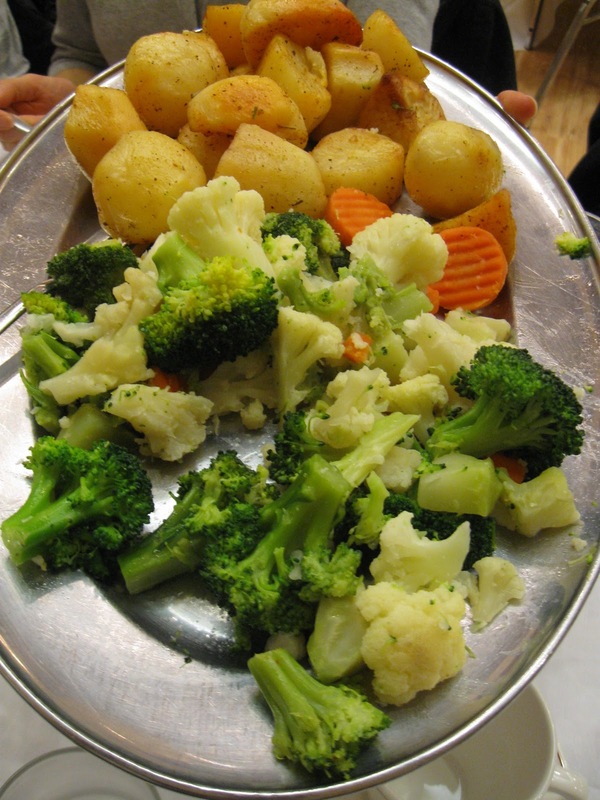 Every Sunday, between 11am-2pm, pranzo (Italian for lunch) is served in the community centre banquet hall. For $20 per person, guests are treated to seven dishes, served family style. It was a lot of fun to meet up with 8 members of my foodie group to enjoy some Italian cooking and hospitality! The fixed menu changes every week, but when you arrive you can check out what's waiting for you. We started off with antipasti. At first glance, I actually thought the tonnato (tuna) was horseradish and took a piece from the bottom layer to avoid the topping (bad flashbacks to mistaking horseradish for mashed potatoes as a child). Reassured it was safe by my fellow foodies, however, I dug in and enjoyed. The meaty flavor of the thinly shaved vitello (veal) contrasted beautifully with lemony tuna smeared on top and decorated with capers. A garden salad in a simple but tasty vinaigrette was served next along with a basket of fresh bread. And it was good bread: crusty on the outside, the soft inside melted like cake on the tongue. I should have paced myself a bit more, but I enjoyed a far too much of it. Next came my favorite course: the pasta! The cheese ravioli were clearly fresh and were perfectly cooked with a marvelous chewy texture. The simple tomato sauce was fresh and bright. Topped off with a little Parmesan cheese, I was in heaven. I seem to have missed snapping a photo of the main course: chicken breasts with a mushroom gravy. These were accompanied by roasted potatoes and a winter vegetable blend. Like the rest of the meal, it was simple but excellent. The chicken was seasoned well and very juicy and the savory mushroom sauce was delicious poured over it and the potatoes. As our server wheel the cart with the cart of cheesecakes towards us, the group collectively groaned, but, being a group of food lovers, no one was going to turn down dessert. We chose between cranberry, berry-lemon, turtle, and peanut butter varieties, but most of us managed to taste all of them. They're all recommended, but I thought the turtle was the real star. I loved the whipped cream topped, cookie crumb crust, and rich chocolate centre together. A rich end to a rich meal. I didn't need to eat for days. ...or for a few hours, anyway. Pranzo at the Santa Maria Goretti Centre is a great place to meet and enjoy food with a group or family (be sure to make reservations). The food is relatively simple and it's all stuff you've had before, but fresh ingredients and TLC in the kitchen go a long way to producing consistently tasty dishes and a very pleasant experience. 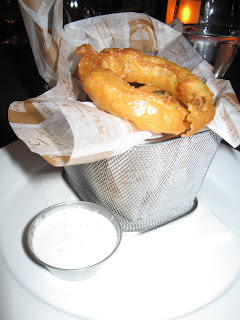 What better way to start a new blog about restaurants in Edmonton than by visiting an Edmonton staple? Bistro Praha first opened its doors in 1977, and, even enduring a terrible fire and relocation in 2010, remains a fixture today. The atmosphere is warm and inviting, and I got the impression the restaurant has many regulars that the staff has come to know well. Bistro Praha has plenty of hearty options to offer, but I made the mistake of coming on a less-than-empty stomach. While I've heard rave reviews of the fried cheese, I had a feeling I would need to be peeled up off the floor by the end of the meal if I went there. The Prague cabbage soup I opted for was a marvelous blend creamy, sweet, and a touch of sour all at once in a mild tomato base. I really appreciated when our server offered half order -- an option available on most dishes -- since I knew I had to pace myself. Dinners are served with a basket of rye bread. It's dense, chewy, fresh, and delicious slathered in butter and dipped in soup. My soup-less dinner company, however, found it a bit dry on its own. Dinners are served with a choice of tomato onion salad or a green salad. I decided to go green. The cheese was fresh and sharp, the lettuce fresh, and the vinaigrette simple but too scant. Steak tartar is the dish Bistro Praha is famous for, but neither myself nor my company was feeling so adventurous. The rainbow trout Jizerka is seasoned and sauteed in butter and served with buttery mushrooms. The report was that it was perfectly cooked and totally delicious. When asking my foodie group for dish recommendations, the classic wiener schnitzel was the next "must eat" after the steak tartar, and it didn't let me down. The pork was tender with a crispy breaded coating, and, with the juice of a lemon wedge squeezed over top, pleasantly flavorful. I swapped the potato salad for roasted potatoes which, like the schnitzel, were delicious in their crispy simplicity. The buttery flavor of the pan-fried peaches in the fresh crepe was very nice, but more peaches would have been even nicer. I decided to bring my meal to a close with a piece of apple strudel. Served covered in icing sugar beside a mountain of whipped cream, as my fork crunched through the flaky pastry a trap door opened in my stomach and I was hungry all over again. It was a touch on the dry side, and, like the peach crepe, I would have preferred more filling in the strudel, but I still had no trouble clearing my plate. The explanation for Bistro Praha's continued success in the competitive downtown Edmonton restaurant scene was clear to me with this visit. Big portions of comforting food made from scratch, and the friendly atmosphere and service give patrons plenty of reasons to come back again and again. I know I'll see them again. Maybe I'll even find the nerve to try steak tartar.